Shunts placed in premature infants have higher rates of infection and obstruction. Rate of 20–30%: Most large shunt outcome studies report an infection rate in full-term infants and older children as 5–7%, whereas in the preterm/low-birth-weight infants the infection rate may be as high as 20–30% (80). Immature immune system: The immaturity of the infant’s immune system is the main reason for the high infection rate. Results in 10-point drop in IQ: Shunt infection and ventriculitis seriously impact the child’s neurodevelopmental outcome and can reduce IQ scores by 10 points (85). Inflammation results in septations: Ventriculitis contributes to subependymal inflammatory gliosis and formation of intraventricular deposits upon which exudates and debris collect. These are the basis of intraventricular septa formation which can obstruct CSF outflow routes and cause multiloculated hydrocephalus (69). 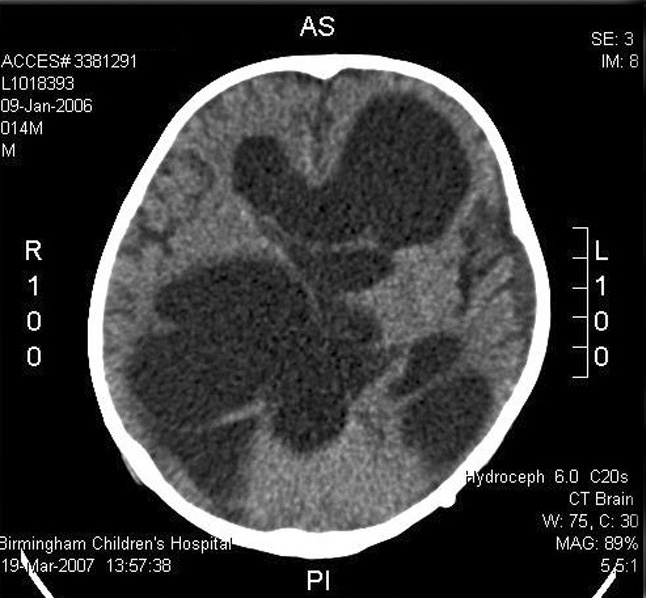 CT scan of multiloculated ventricles: A 14 month-old boy who had a grade IV IVH and required treatment with an EVD. Treatment was complicated by a ventriculitis and the gradual development of multiloculated hydrocephalus. 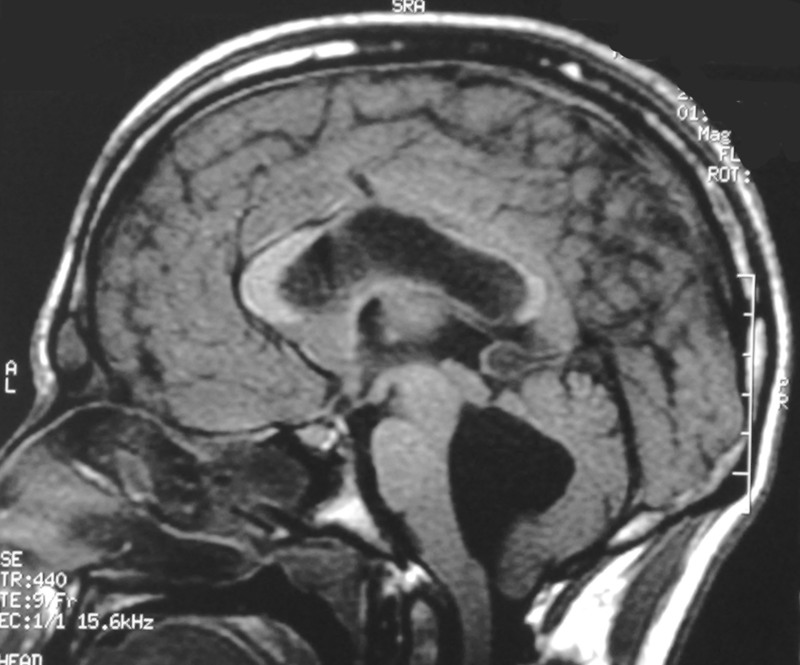 T2-weighted axial MRI of multiloculated ventricles: A 2-year-old female who had a grade IV IVH at birth. Note cystic necrosis surrounding left occipital horn. Management seeks to simplify: Multiloculated ventricles are very challenging and difficult to treat. Surgical options are cystoperitoneal shunting, stereotactic cyst aspiration, craniotomy for open fenestration of septations, and neuroendoscopic cyst fenestration. The goal is to simplify cystoventricular anatomy, usually by endoscopic cyst fenestration, and then shunt a single compartment with one catheter. Infection increases incidence: Isolated fourth ventricle can be seen in infants after IVH, but ventricular infection significantly increases the rate of this complication. The blockage of the aqueduct and the foramina of Magendie and Luschka by arachnoid scarring, subependymal gliosis, and septal formation in combination with continuous CSF production by the fourth ventricular choroid plexus results in isolation and expansion of the fourth ventricle. 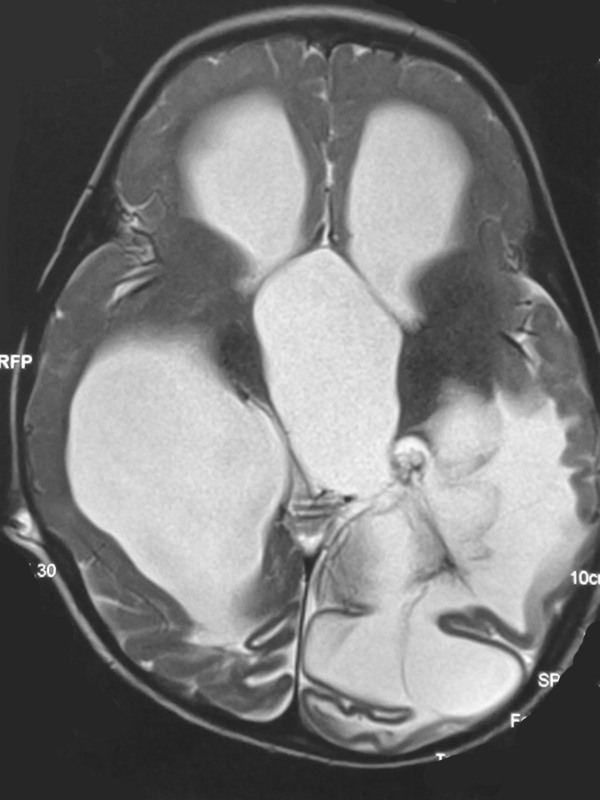 T1-weighted sagittal MRI of isolated fourth ventricle: An 18-year-old man who experienced a grade IV IVH at birth, resulting in the need for a shunt. This MRI shows a dilated fourth ventricle, presumably due to scarred, obstructed inlets and outlets to the ventricle. Indolent signs of brainstem dysfunction: Compression of adjacent brainstem and vermis can be suspected clinically by signs such as ataxia, cranial nerve palsies, hemiplegia, vomiting, and breathing abnormalities. Treatment by shunting, aqueductoplasty or endoscopic fenestration: Treatment options are surgical and aim to restore communication between the fourth and third ventricles or to provide permanent relief of the fourth ventricle’s expansion by shunting. The latter goal can be achieved with a ventricular catheter inserted with neuronavigation or with an open technique and shunting to the peritoneum. The catheter should float freely in the ventricle, but there is danger of entering the brainstem after the ventricle shrinks. Neuroendoscopic techniques can reopen the occluded aqueduct and restore communication between the third and fourth ventricles. Cerebral aqueductoplasty can be performed by a frontal or a suboccipital approach, and placement of a stent into the aqueduct has been found more effective for preventing repeated occlusion than aqueductoplasty alone (13).